Colleen gave me this for my birthday from the Playgirl closet and it’s been gathering a nice amount of dust since. I am after all, a robot. Inside my chest beats a cold unloving heart. I’ve been so hyperfocused on this show that even the thought of anything of a sexual nature barely makes my freeze dried uterus creak. You could parade a line of hot Korean men in front of me now and I’d yawn. Every ounce of energy I have and don’t have is being poured into this show. EVERY ounce. The idea of romance sickens me because it’s time consuming. Crushes are lame. Desire is for the weak. I’m obsessed with my show in New York. And nothing else. I had a vision of myself 20 years from. If I am as obsessed as I am now about my own work, I will surely, surely, start talking like a robot and live alone with my robot cat into my old age. I will menstruate the tears of a witch. I will beat my steel chest with my mechanical fist. I am ROBOWONG 3000, the sexless and unloving creature spawn from working too much. My friend Denise had a baby last year and I was asking her if her show feels different to her having done it before she ever had a baby and doing it now. My last show Free? felt so different from the first time I did it til the last time I did it last year. I had lost a ton of weight in that time, went from gangly to less gangly and I noticed how each word came out differently in my new body with the new history it had lived. I am wondering if this new show, feels that way in my new sexless workaholic body. I am indeed, the Ice Queen. So, if you were wondering. A week ago, on my birthday, I put my number on the web and allowed people to call me to wish me a happy birthday. Surprisingly, I knew everyone who called. And no creepies. This list included: Wes (Seattle), Joz (LA), Sunshine (NY), John Daley (Australia), my mom (SF) and some others. I also got a text message from Catzie in Philly and my friend Elz who lives in SF now. I also got a bunch of emails from people who remembered it was my birthday. 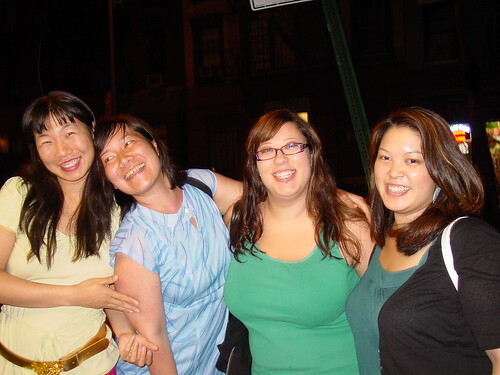 I like NY because I sent an email out at 1pm, and I got to see all these people later that night at my birthday dinner. 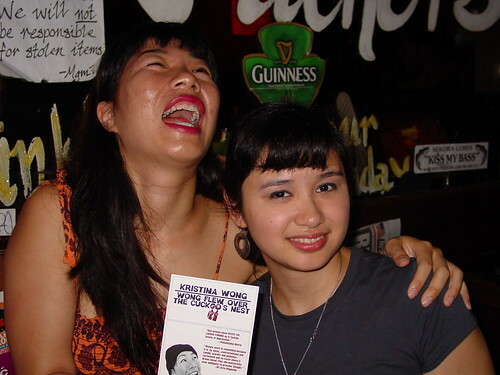 And coincidentally ran into Celeste, an old bride from Big Bad Chinese Mama who was eating next door. Anyway, the festival started yesterday. It was great fun. The Mayor sent a proclamation and my show name was in the proclamation. I will post pics later and show you. Here is Marjorie, who is helping me from aging at twice the speed of light.